I know I haven’t used this blog much lately. Life starts to happen, I get busy, don’t find time to write. But I’m going to try to do a teensy bit better about that. 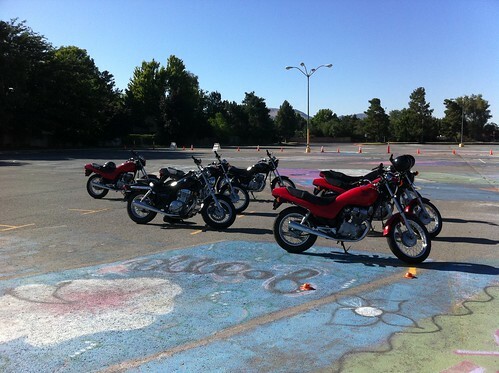 Last week I took the Motorcycle Safety Foundation rider’s course. I’ve ridden before, actual motorcycles. Not a lot, but I have. I also own a Tau Tau 50 cc scooter that I’ve been putting around town with the last few months. It was so much fun! The biggest problem is that it has no power. I can only achieve about 35 mph on the road, which can get me in some trouble with the traffic around here. It is also not as responsive as I would like. If I was ever in a tough spot and needed to get out of it quick, I wouldn’t be able to, because that scooter just doesn’t do fast. 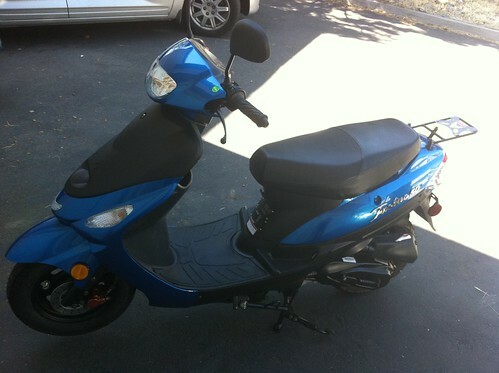 Since I’ve gotten so good with the scooter I decided to look into actual motorcycles. I signed up for the MSF course, and couldn’t wait to get out there and ride. It was a 2 day course. I was pleasantly surprised that the first day consisted of about an hour and a half in the classroom and then about 6 hours on the bikes. Our training location was a high school parking lot. In that picture my bike is actually the one furthest left in the back there. The course was a lot of fun, but more difficult than I had anticipated. We learned basics of riding. We learned swerving, making figure 8’s, going into and coming out of sharp turns and S curves. It was over all a lot of fun. The final test you could score up to 21 points on (the more points the worse you did). I scored an 8, which was not lowest in the class, but it wasn’t highest either. I got points added for going outside the box on the figure 8 maneuver and for not going fast enough in the S curve. 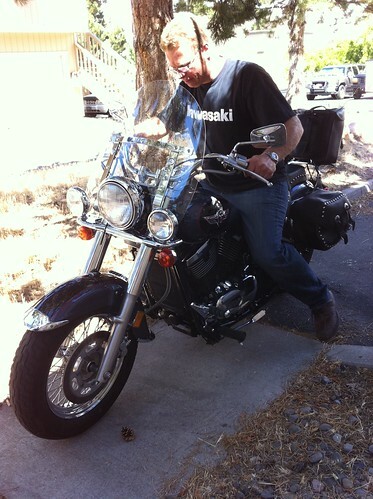 As soon as the class was over I went down to the DMV and got my motorcycle endorsement on my license, so I could legally drive a motorcycle within an hour of completing the course. Awesomeness. After the DMV I went down to the Kawasaki dealership because they had an advertisement for a 250 honda rebel that I was interested in. It was the same bike as what I had taken my MSF course on. I got there and they didn’t have it. 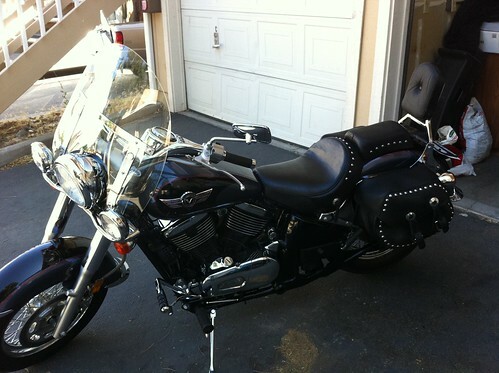 The salesman tried to upsale me to a Kawasaki Vulcan 800 classic. I thought that 800 might be a little too much bike for me being a beginner. I tried the bike out anyway, and fell in love. I went back the next day and bought it, and then the following day had it delivered. Since getting the bike I’ve driven it back and forth to work daily. I had it out on the freeway yesterday and today. I also learned today what it feels like when the bike runs out of gas. Luckily the bike has a reserve tank, so I was able to flip over to that and make it to a gas station. 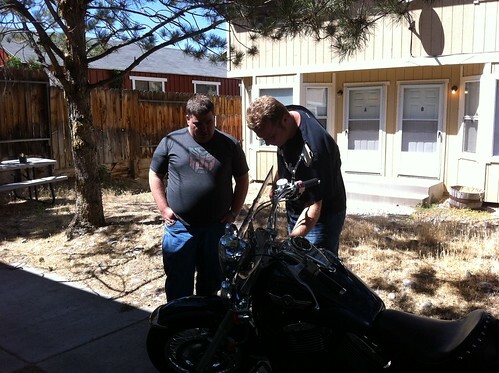 I’m loving the bike, and I am SO glad I went with an 800cc bike instead of a 250cc. I intend to hold onto this bike for a long while, and I think I would have outgrown a 250cc pretty quickly.